This is the Delta Airzound Bike Horn and it saved my life yesterday. It’s a 115 dB horn that runs off compressed air. You recharge it with a normal bicycle pump. 115 dB is loud. Really loud. It’s right in between being front row at a rock concert and physical pain. 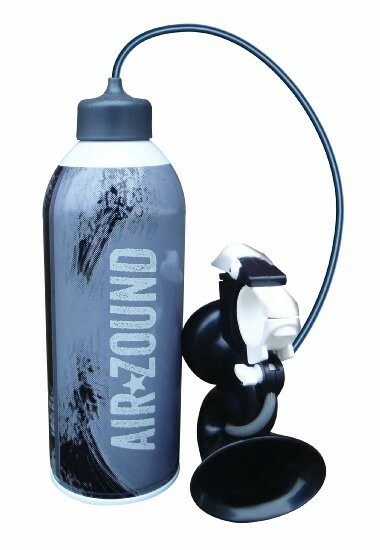 The air canister can either go in your water bottle cage (although that rattles a bit) or you can affix it to the bike frame with the included velcro and zip ties. The horn attaches to the handle bars so you can hit the button to sound it with moving your hands. The horn attachment is not well designed. There is a ring that screws onto the bars and then the horn is supposed to snap onto the ring. In practice though, the horn falls off as soon as you press it. I solved that with another piece of adhesive velcro. I was riding home from work yesterday, using the dedicated bike lane on Kentucky Ave coming from downtown. Cars are allowed to pull into the bike lane just before the intersection so they can make left turns. There are dotted lines and a giant left turn arrow. Most people haven’t been able to figure this out and they just turn left from the car lane. That means they end up swerving right across the bike lane, often at the last second, and that’s exactly what happened yesterday. There was a small SUV right next to me as I was entering the intersection. Without once looking over, she just started to turn directly into me. I fired off the horn and this lady about jumped out of her skin. She came to a dead stop in the middle of the street and, this is the important part, did not run me over. I don’t have to use the horn very often but it sure does the trick when I need it. A+, would recommend to all commuter cyclists.